I dunno if this is the right section but I know that Comodo ITSM is with Endpoint Security so please pardon. I would like to seek information on how to start using Comodo ITSM and use it under Comodo One. I understand that Comodo ITSM is now part of Comodo One. I seek this information as I am about to start a promotional giveaway/contest for Comodo ITSM with the great assistance and sponsorship of Mr. Melih. I am not that very well versed with it (all I know is CIS sorry) so to let those who will join in be more informed about its true effectiveness I opted to seek additional information and explanation here. This is sort of a noob question but frankly I am not knowledgeable on this so please pardon me and do view this as a start-up endeavor. Say, I have a license of Comodo ITSM and I want to deploy/administer/use it on my devices at home or in a small store I own, I will need to install it and create an account, correct? Sorry I just know the overview of CITSM here and the product info sent to me. Comodo IT and Security Manager (ITSM) - Allows MSPs and enterprises to manage, monitor and secure mobile devices and Windows endpoints which connect to customer networks. Once an iOS, Android or Windows device has been enrolled, administrators can quickly apply configuration profiles which determine network access rights, security settings and general preferences. A powerful addition to any MSP / Enterprise toolkit, Device Manager allows you to secure customer data regardless of the device that holds it. 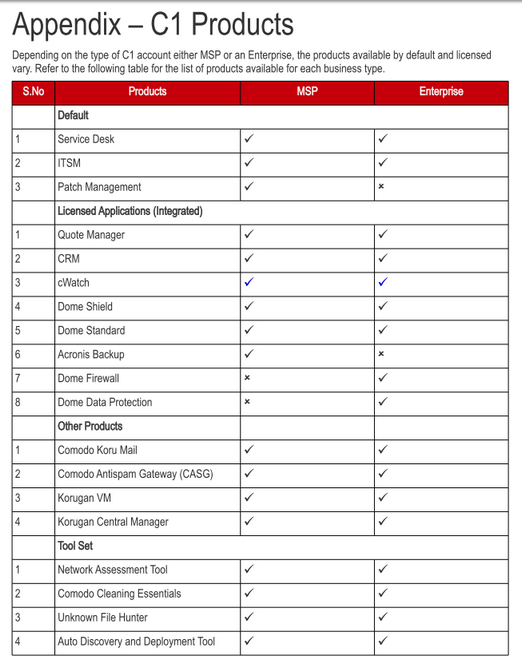 ITSM is available by default to customers that signed up for Comodo One version 3.0 and later. Customers that signed up for Comodo One prior to version 3.0 version can integrate CDM to their console, if required. Futher what will I register MSP or Enterprise? I have registered previously using the link above (understand that its MSP also) but there seems to be aproblem with the login as when I finished with it. I could not log-in successfully with the details I have registered with the account. I only have a license for Comodo ITSM good Sirs. I see that there are two types in page 157 of Comodo One Adminstrator Guide ver3.7. Please see image below. The download link for Comodo One will be sent to the email correct? There wasn't any email yet from Comodo. I have downloaded and am reading the user guide-introduction for Comodo ITSM ver6.2. It has a "Create an Account", but it also says there that "After your ITSM administrator has created a user account for you.." , well in this case, I am to be the admin and have not started yet. Thus I cannot find anything there to help jump-start the usage of Comodo ITSM. The quoted text below is from the Comodo ITSM user guide. After your administrator has added your device, you will receive a device enrollment mail. This will contain links which will allow you to download and install the iOS, Android, Windows or Mac OS X software appropriate for your device. You can use the same enrollment email to enroll multiple devices. Please ensure you open the mail on the device you wish to enroll. The following sections provide detailed explanations on enrolling devices with different operating systems. Can you please check my "surmised" procedure below. a) Register for Comodo One account. Or if its flawed, please do so kindly state what are/should be the proper way for a start-up like this. I am not knowledgeable in this regard, the reason why I am seeking additional information on this thread so when I promote Comodo ITSM there will be sufficient information how to set it up and use it for IT admin needs. This soon to be promotion is geared towards the admins out there to let them know how good Comodo ITSM is and its effectiveness over the other endpoint security out there in the market. I have sought information in this regard previously but it may that people are really busy and may not have the time, but if I may, this is for a promotion of Comodo ITSM. I seek only to obtain the proper information (on a noob standpoint) so I can start the promotion.